This is so sweet! Look at ME! A wonderful couple, Barbara and Reuven, brought this photo to the barn for John and Dottie. 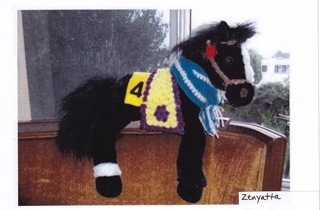 In the note, Barbara said she made this as a gift for Reuven last year for Christmas because he was “A SUPER FAN OF ZENYATTA SINCE HER VERY FIRST RACE!” She crocheted the scarf in John’s stable colors and then made the other pieces to go with it. I guess they have been following John’s horses for some time now. According to Barbara, “they were there when Giacomo broke his maiden and followed him all the way to the Kentucky Derby victory.” This is adorable. Then when they read that “Zenyatta was toying with Tiago in her works”…they came to my maiden race and have followed me since. Horseracing is such a special sport. I have been greatly blessed to meet so many wonderful people during the last few years. Just think…this Thanksgiving will mark the 4th Anniversary of the day I broke my maiden. I truly have so much to be thankful for each day! I agree Katie…you are undefeated in our eyes. There is not a horse out there that could have beaten you! You know it and so do we. Zen, you are the greatest race horse of all times. Sweet Zenyatta…I’ve been racing ALL day to make a few free wonderful moments to correspond to you. You are so EVER on my mind; even when I’m working with a customer ( glad they don’t know that11). Do your ears perk up during the day when you see other equine ” hitting the track”, then droop when no one comes to fetvh you? So, if anyone an do horse to jorse, please email Zen, in Zen script, & let her know it’s nothing she did…just something she earned. I love that doll !! I would buy 10 of them as gifts for all my family at Christmas … We love Queen Z…! I found a friend on FB that will be coming to Appreciation Day and promises some video and pictures! Dont you worry…Lane’s End is going to make sure you are happy..and you’ll have your old stable mate back! Still chilly and rainy here in Ky! I saw pics today of visitors there with you..you seemed so content but then you are always sweet! I sure hope some of the other people who have taken care of you will be able to come to Ky to ensure that you will have everyone important to you! Mike’s in Japan racing..sure hope he’s had a safe trip and will be back on the 29th. He must miss you terribly! I sent him a picture of a house that is for sale in Versailles.It backs right up to Lane’s End Farm…wouldn’t that be nice..he could come whenever and have a Ky home too! You are going to be ok here girl I hope all those who share your life with you now know that. We want the very best for you is all we want.Well…this Ky girl has to go to lights out…big day tomorrow…sleep peaceful and content lady..so many love you..God bless all those who are there with you and may they all have a wonderful day of thanks! So long from “ME’ under the moon over Ky! Happy Thanksgiving Z! You made my year a great one. So much joy and anticipation in seeing you run and watching you dance. Blessings to you this day and always. Hope you get your favorite treats tomorrow in celebration! My sister Cate and I met Barbara when we were at HP for win #17-she told us she was knitting a scarf! I’m so glad you received it! Thanks for the audience today, O Queen of my heart! We loved singing your song to you, and I have pictures, video, and memories to last a lifetime. All your people were gracious and generous, and it was special to see them smile big smiles because of you. Mario, Steve, and John ALL have great smiles! We heard which stallion you would be seeing next spring, but we promised not to spill the beans. Your regal bearing has inspired me to clean up my act and become regal, myself. Thanks for the inspiration! A Happy Thanksgiving to you. You have given me so much enjoyment in watching you perform. I truly have fallen in love with you! I hope to visit you at Lane’s End as I am just a short drive away (Indianapolis). Also a special thanks to your racing family for the love and care they have shown you. You are a true gift! I hope to see a Z-offspring in John’s barn in the near future!!!! Happy Thanksgiving to all at Team Z!! Have a wonderful day and be sure Queen Z has her Guiness with her apples and carrots. We’re off to a family dinner and must go to my barn to be sure my horse family have a special day. I LOVE the Zenyatta plush – I want one!! You could start a line, and the proceeds go to Equine Rescue….Happy Thanksgiving to you Queen Z – I am Canadian, so our Thanksgiving was last month, but for Zenyatta fans EVERYDAY we got to see you and especially when we got to see you race was Thanksgiving!! What an adorable gift!! I’d love one to cuddle while I am reading the Zenyatta Commerative Issue by Bloodhorse. Wish you and your team a blessed Thanksgiving. And I have been blessed too-for your team sharing you with me, as well as all the other blessings I have. I love you Z. Hope you have a wonderful life and your pregnancies are not too hard on you. Hope to see you one day. Dear Zenny, As crazy as it may be, I am going to drive from S/E Arizona to be at your (gulp, I hate to say this) “farewell” party. I was born in CA and hope your wonderful people family will one day let you “come home” to raise your babies. And Rita and Linda nailed it – a line of Zenny plush toys would sell almost as fast as you run! The proceeds could go to one horse rescue charity and one human children charity. Well, see you on the 5th. Enjoy your Guiness and sweet potatoes!